If you’re gearing up to get your driver’s license, you’re probably feeling both excited and nervous. Taking the driver’s test is a huge milestone in any young person’s life, but most people don’t emotionally prepare for the possibility that they could fail. If you spend plenty of time practicing, this isn’t likely to happen, but if you go take your test without being ready, you could face embarrassment or even endanger yourself on the road. If you don’t properly signal or look over your shoulder before changing lanes, you will be penalized. DMV instructors are meticulous about lane-changing practices for a good reason: Changing lanes without taking the proper precautions is extremely dangerous. If you were to continue driving this way, it’s almost guaranteed that you will eventually have an accident as a result. You already know not to go barreling down the road like an out-of-control train during your driver’s test, but you may not realize that even minor speeding could set you back. Your DMV instructor will be watching every move you make while you’re in the car, and if you take your attention away from your speed for even a minute or two, you could accidentally begin driving over the limit. Aside from keeping your eyes on the road, watching your speed should be your top priority. Chances are, your DMV instructor will direct you to a four-way stop to test your ability to properly yield. Remember, right of way always goes to the first car to come to a complete stop, and if you and another driver arrive at the same time, the person on the right goes first. If the intersection forms a T, then the straight-moving traffic has the right of way. Keeping these rules in mind will go a long way in helping you pass your test. Always remember to come to a complete stop at a stop sign or traffic light. Performing a rolling stop could cause your DMV instructor to fail you, even if you slowed down quite a bit. It may seem silly to come to a complete and total stop when there are no other cars around, but it’s still something you should practice. Not only is it important for safety purposes, but it’s sometimes necessary to determine right of way. If you’re going to be using a friend’s vehicle to take the driver’s test, be sure to practice with it beforehand. Learning to drive in your mother’s minivan and then taking the test using your friend’s sporty convertible is probably not a good idea. To pass, you will need to be aware of how to operate certain functions, such as the windshield wipers, turn signals and emergency flashers. Always be sure that you can demonstrate knowledge of the vehicle you will be using for the test. It’s normal to be nervous before your test, but if you let your anxiety get the best of you, it could cause you to fail. 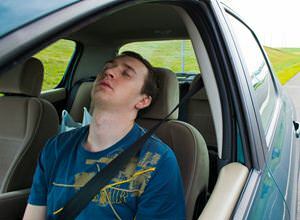 Nerves can lead to impulsive actions and a lacking attention span, and if your DMV instructor notices you acting sketchy at the wheel, he or she may deem you unprepared for the road.